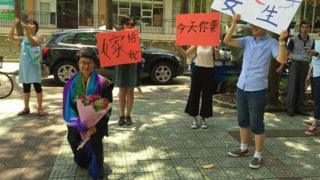 Image caption Jean Ouyang proposed to her girlfriend as the people in the background wave banners saying "Will you marry me today?" More than 75,000 people have signed a petition by an international LGBT group calling on a Chinese university to apologise to two lesbian students. Xiaoyu Wang, whose girlfriend publicly proposed to her at their graduation ceremony, was refused her diploma. The Guangdong University of Foreign Studies reportedly told the couple their act had "violated regulations". Ms Wang has since received her diploma, but said the couple were told to "keep our homosexuality to ourselves". Jean Ouyang, who proposed to Ms Wang, told Chinese media the "mental and emotional harm" caused by the actions could not be erased. "The most romantic day of my life turned into a nightmare", said Ms Wang. "I'm devastated and humiliated, but I'm fighting back and need your help," she wrote on social media. The university has declined to comment to media about the case. Officials with the on-campus Communist Party had reportedly told the couple that they would "face punishment", after pictures of them kissing went viral on Chinese social media. Ms Wang says that one official accused her of spreading vulgar content and misbehaving in public despite warning from the university. "We decided to propose to each other on campus because it's a way to express our feelings, and raise awareness of LGBT issues," the 23-year old translation student told the BBC. Ms Wang says that university officials also outed her to her parents by asking them to come and collect the diploma together with their daughter. An official also sent the video of the marriage proposal to Ms Wang's mother, she said. "My biggest headache now is how I mend my relations with my parents," Ms Wang told the BBC. "Last week, my mother called me and said I hurt her badly." The lesbian, gay, bisexual and transgender group (LGBT) All Out has called on the university to "apologise publicly to the two students". It added that "comprehensive measures to prevent discrimination and homophobic harassment on campus", should also be taken. Some supporters delivered the All Out statement to the university headmaster, who said he would take a look at it, reports said. A 2012 poll by an LGBT organisation, Aibai Centre, said that in a survey of 421 students, most of whom identified as gay, 77% of them said they had been subjected to bullying on campus because of their sexual orientation or gender identity. Ms Wang said the couple's case was not an isolated one and that discrimination should end. "I'm sick of staying silent," she wrote. "No school should intimidate students for who they are or who they love. My case is just one in many, but it could spark a change."